The SSAB series rotary broom sweeper is hydraulically powered and mounts on skid steer plates that are quick attach compatable. The broom is 32 inches in diameter and available in widths of 6 ft., 7 ft. and 8 ft.. The unit comes standard with manual angle left or right and can be converted to hydraulic angling. Brooms are available with all poly brushes or brushes with poly and wire sections alternated for heavy duty cleaning on paved surfaces. 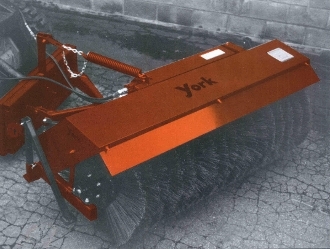 The SSAB series York Broom is designed for use by contractors, landscapers, municipalities, institutions, farmers, and others needing a heavy duty commercial sweeper to mount on their skid steer. The SSAB can be used for general cleaning sweeping dirt and debris, as well as for snow removal. Landscaping contractors can also use SSAB models with all poly brushes for dethatching lawns. The sweeper is a standard style sweeper where you windrow the material into one line for pile for picking up with a vacuum, loader, or other means. For skid steer loaders we also have the SSPU series that mounts on the bucket instead of the quick attach plate giving you a container to hold the material. For the SSAB series, look at the information on this page, for the SSPU series that mounts to your skid steer's bucket, click on the link at the bottom of the page. Hydraulic drive standard - equiped with a gerotor type hydraulic motor for smooth, reliable performance. The factory provides hoses to the mounting frame; if required, additional hoses must be added by user. Polypropylene convoluted brush sections are standard, crimped wire or a 50/50 combination can be supplied at no cost - your choice. All polypropylene (all poly) are used for dethatching on grass or sweeping on decorative brick or stone where you would be concerned about damage. A 50/50 combination of wire and poly is recommended for street, parking lot or sidewalk use on pavement or asphault with heavy dirt or mud deposits. We normally don't recommend all wire unless you are clearing areas full of mud, as the 50/50 mix with the poly tends to prevent the wire bristles from bending over from use and is usually severe enough, but we can ship the units with whatever choice of broom you want. Unit weight for model 009424 is 550 lbs., units are crated, add 200 lbs. for a shipping weight of 750 lbs.